A set of fascinating new paintings by Australian artist, Joel Rea celebrates the power of nature and manages to make us feel ever-so small. Using oil on canvas, the contemporary surrealist painter portrays massive ocean waves, powerful winds and falling rocks. Within those brutal natural landscapes he places lonely men in suits, and sometimes tigers, with the goal of making us feel insignificant against the elemental forces. In his work, Rea captures the dynamic motion of natural elements, while inspiring a deep feeling of humility. He represents how small we are within nature, leaving us wondering who has the ultimate control in this world. Using slow-drying oil on canvas, his richly colored, detailed scenes come alive. 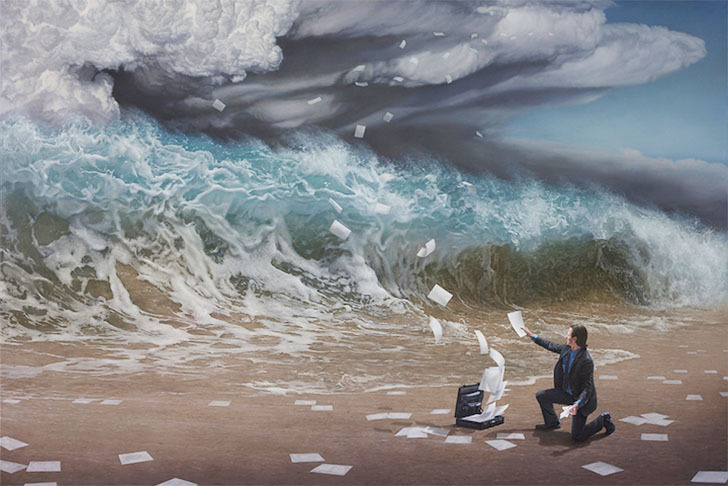 If you want to see more of Joel Rea’s surrealist world, check his older paintings here. He represents how small we are within nature, leaving us wondering who has ultimate control in this world. Using oil on canvas, his richly colored, detailed scenes come alive. ea's paintings look like stills from a vivid dream, where a man in a suit stands on an empty beach looking helpless. Resolution, The Final Pieces, Edge of the World and The Time Has Come are some of the names of his cinematic paintings. 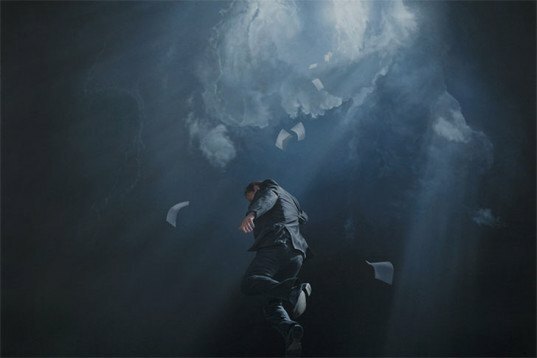 If you want to see more of Joel Rea's surrealist world, check his older paintings. Rea captures the dynamic motion of natural elements inspiring a deep feeling of humility.